Impromptu visits to pastry shops, unplanned scenic walking routes and people watching at beautiful cafes seemingly around ever corner has got to be one of the best parts of being in Paris. Eating expertly crafted, thoughtfully decorated and tasty desserts really takes the cake for me, literally. After visiting the Notre Dame cathedral, we headed towards the Eiffel Tower for some obligatory sight seeing. 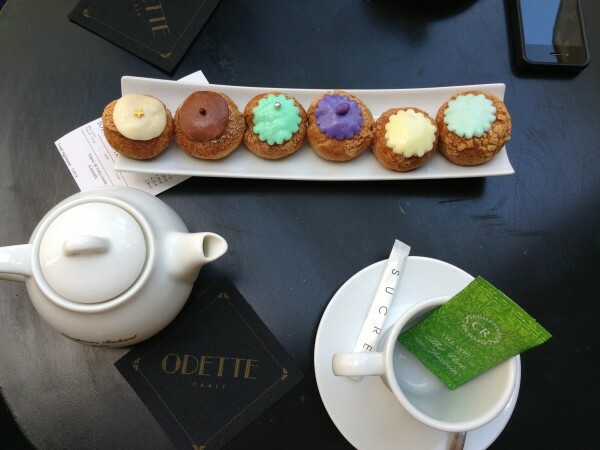 On the way, we stopped by the cutest Parisian choux creme shop called Odette. We shared five choux cremes – caramel, chocolate, pistachio, wildberry, lemon and green tea. Each were puffed pastries, browned and a little flaky to the touch. Injected with luscious creams and topped with an icing made with each respective flavour, our favourites were the pistachio and the green tea choux. A little too much for us in one go though i.e. sweetness overload. Next time, we might just do one each or take them to go. If you’re in the neighbourhood, this is a lovely place to stop by at any time of the day for some coffee, dessert and some good vibes. Tags: Coffee, France, Odette, Paris.